When first studying the art of another culture, with another language, one of the primary problems I have is understanding the new terms and their intended use. Although I continue to have difficulty at times, I always find that it is helpful to create a glossary to have as a reference. You will still find words used without any explanation or used so that they actually add to your confusion. But over time they will begin to clear up. These are all terms I have found that relate to some aspect of Chinese Scholar's Rocks, also known as Spirit Rocks. These terms are listed alphabetically. Some Chinese terms will have more than one meaning. Similarly, there will sometimes be more than one Chinese term for an English word or meaning. These have been cross-referenced whenever noticed. For use of each term relating to stone classification in classification order, see the Scholar Rock Classification page. 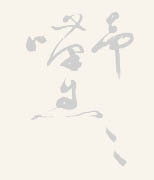 Baojing. A coating on the surface of rocks due to exposure to air or frequent touching. A mark of antiquity that enhances the value of such stones. Changhua [rocks or stones]. Rocks found at Changhua, Zhejiang Province. Soapstone. Chou. Ugly, with a connotation of charm and distinction. Fenglishi or Fonglishi. Stones found in the provinces of Xinjiang, Inner Mongolia and the Gobi desert of Ganxu. These stones display the natural wearing action of the desert winds and sand. Usually light in color. Gan. Dry (as in surface texture). Gongshi. Scholar rock; miniature garden rock displayed and appreciated indoors. Gu. Ancient, with elegance and appeal. Guai. Unusual or strange, with the added and favorable connotation of interesting, wonderful and special. (See also qi and yi). Guaishi. Fantastic rocks. Before the 20th century, used for both garden and studio rocks. (See also qishi and yishi). Hongheshi. Red River rocks. Rocks found in the riverbed of the Red River, Guanxi province. Huanglashi. Yellow Wax Rocks. Rocks found in Guangdong or Guangxi Provinces. Yellow wax rocks have surfaces that almost appear to be partially melted, or with a naturally polished surface resembling wax. Collected in riverbeds. Composition appears to be sandstone, jasper, or perhaps andesite with silica. Kunshi. Rocks found in Kunshan, Jiangsu province. Created from siliceous liquid that filled the holes and fizzures of dolomite to form crystals. Laoshan lushi. Laoshan green stones. Lingbishi. Also called Lingshi. Rocks found in Lingbi, Anhui province. Black limestone; medium gray limestone that is highly eroded but without perforations; buff limestone; green limestone with peaks, grottos, stalactites and stalagmites. Many colors and types. most renowned are dark in color. Some have traces of red clay in bases. Often have resonance. Surfaces are grooved and channeled from erosian of slow-moving water. Original cave rocks are dark gray or black. Lingshi. Rocks found in Lingbi, Anhui province. Lou. Channels and other types of indentations. Mingsheng qishi. Rocks collected as souvenirs of sacred mountains, famous geographical locations or historic places. Penjing. Basin scene. Verticle stones used to depict mountains and set into a basin or tray. In China, many things can be added to these rocks to create other types of penjing. Often added are soil, sand, living trees, and miniature clay figures of people, houses, bridges, and boats. Qi. Unusual or strange, with the added and favorable connotation of interesting, wonderful and special. (See also guai and yi). Qilian rocks or stones. Rocks found at Mount Qilian, Gansu Province. Black limestone. Qingrun. Clear and moist. Considered to be the perfect degree of surface luster between glossy and matte. Qishi. Fantastic rocks. Before the 20th century, used for both garden and studio rocks. (See also guaishi and yishi). Run. Moist (as in surface texture). Shangshi. Admirable rocks. Rocks identified by qualities admirers saw in them. Shankeng. Mountain deposits. Stones found in the mountains or at the base of mountains. Shou. Thin, vertical and slender. Shoushanshi. Rocks found at Shoushan, Fujian Province. Mottled yellow soapstone or golden silica in the form of quartz. Shoushan stones are divided into three catagories according to presumed source; field, water, or mountain deposits. They are often further divided based on color and internal markings. Shuikeng. Water deposits. Stones found in lakes or rivers. Taihu rocks or stones. Rocks found in Lake Tai, Jiangsu Province. White perforated limestone with significant erosion. Also black limestone. Wuxi, Zheijiang Province. Swiss cheese appearance with many holes. Limestone, but lighter in color than Lingbi or Ying Shih. Tiankeng. Field deposits. Stones found in fields; areas between the mountains and the rivers or lakes. Tou. Holes and Openness. Also refers to indentations that are not holes. Wanshi. Stubborn rocks. Rocks identified by qualities admirers saw in them. Wenfang yashi. Scholar's rocks or "elegant stones for the scholar's studio". Wenya. Literary elegance; sparse elegance of the scholar's studio. Yashi. Elegant rocks. Rocks identified by qualities admirers saw in them. Yi. Unusual or strange, with the added and favorable connotation of interesting, wonderful and special. (See also guai and qi). Yingde rocks or stones. Rocks found in Yingde, Guangdong Province. Black limestone perforated with peaks and grottos; dark gray Ying limestone. Ying shih rocks; dark gray limestone, grooved or channeled and striated. Distinctive surface dimpled and pock-marked. Yishi. Fantastic rocks. Before the 20th century, used for both garden and studio rocks. (See also guaishi and qishi). Yuanlin lifeng. Garden Rocks or "upright peaks for the garden". Yung river stones. Stones found in Yung river, Hunan Province. Most noted for Chrysanthemum stones. Zhauqing rocks or stones. Rocks found at Zhauqing, Guangdong Province. Off-white limestone with multiple perforations. Zhou. Wrinkles, deep furrows, relief ridges or intaglio lines. Zibowen rocks. Wen rocks found in Zibo, Shandong province. Composed of lime, granite. Aragonite forms are usuallly black and very hard. Hu, Kemin, The Spirit of Gongshi, L.H., Inc.